The village has not been as stirred up as this, by a single issue, since the Radley Lakes. A packed public meeting in Radley Village Hall on Thursday has unanimously demanded the abolition of parking charges at Radley Rail Station. 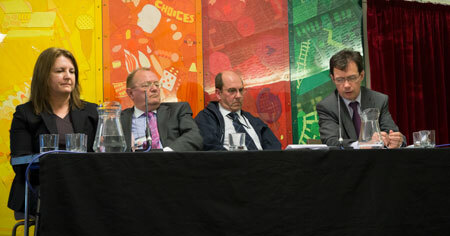 The demand was made at a specially convened public meeting, to address problems in the village caused by “outspill” from the station car park, before a panel comprising Sarah McManus, Principal Property Project Manager for First Great Western; County Councillor Rodney Rose, Deputy leader of the council with responsibility for strategic rail; Chris Hulme from Thames Valley Police and David Tole, a Principal Engineer from Oxfordshire Highways with responsibility for Traffic & Safety Improvements. FGW, represented by Sarah McManus, was called upon to explain their parking policy which had caused many rail commuters arriving at the station by car to park their cars on the village streets, rather than in the station car park, resulting in a nearly empty car park and cluttered streets in the surrounding neighbourhood. (See previous news item.) The only excuse they could offer was that the proposal to charge for car parking formed part of the original Business Plan, which had been the basis for the bid for the grant from the Departrment for Transport (DfT) that enabled the car park extension to be built. After tenaciously holding to this excuse for most of the duration of the meeting, despite statements in a letter from the DfT clearly indicating that charging was never a condition of the grant and that the DfT panel had gone as far as to express concerns that charging might not be a good idea because of its predictable effect, and despite the evidence that usage of the car park had fallen significantly below what it had been before the extension was built, FGW eventually relented and agreed to go away and investigate the possibility of varying the Business Plan and reviewing the charges. 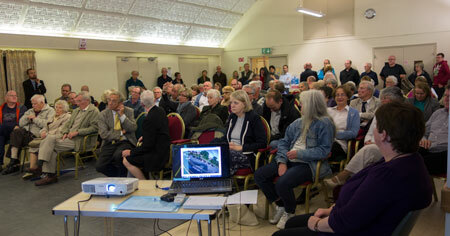 After all the effort to get this far, the meeting was in no mood to consider even the possibility of implementing traffic control measures which would involve covering some, if not all, village streets with double yellow lines, in order to force rail users back into the car park, until the issue of charges was resolved. Left to right: Sarah McManus, Principal Property Project Manager First Great Western, Councillor Rodney Rose, Deputy leader of Oxfordshire County Council, Chris Hulme from Thames Valley Police, and David Tole, principal engineer from Oxfordshire Highways, fielding questions from the meeting. Problems at Radley Station began when Greene King closed the neighbouring Bowyer Arms car park, which had hitherto provided overflow parking for the railway station, to all but their own customers. The excessive numbers of cars using their car park was impacting their business and, in the light of this, the action they took was reasonable. With the station’s own car park unable to cope, cars inevitably overflowed onto the streets. FGW, to their apparent credit, undertook to extend the car park, which they did without too much delay, with the aid of a grant from the DfT. The possibility of charging customers to use the station car park was mooted, but the Parish Council strenuously objected to this and an undertaking was understood to have been given that charging would not be introduced. The Parish Council was therefore as surprised as anyone when the signs and the ‘Pay Here’ machine appeared at the time of the official opening of the car park in May. The effect was immediate and severe. Not only did the streets of Radley have to cope with what had been an unavoidable modest overflow, but also a significant additional outspill due to a high proportion of rail users refusing to pay the charges, with the result that car park usage actually dropped. A photograph, taken on a recent weekday morning, was presented at the meeting showing just 4 cars in the new extension and the original car park half empty! In other words the new car park, with charging in place, had made matters worse. Indeed, the new extension seems have been a waste of money, since exactly the same effect would have been achieved by introducing charging in the original car park. The illogicality of all this seemed to have escaped some, if not all of those on the panel, which made for a rather heated meeting at times as people’s frustration with FGW’s intransigence grew. Several people pointed out why what had been done was nonsensical, least of all from a business point of view. The car park extension had singularly failed to achieve its principal aim, that of relieving the parking overflow problem. Whether the penny actually dropped or whether they simply wanted to go home remains to be seen, but the FGW representative did eventually promise that the policy would be reviewed with a view to varying the terms of the bid. Nevertheless, Radley residents and rail users had taken the opportunity to make their views known en mass in no uncertain terms. Even if First Great Western continues with their obstinacy, our representatives on local government, and other government authorities, should take due note of the mood in the village, and review their tacit support for, if not complicity with, FGW’s current charging policy. It was pointed out, and generally accepted that, even without charging, with rail usage predicted to increase, the day would come when the existing car park would not be big enough and overflow onto the streets would be unavoidable. Minimal traffic control measures, to ensure safety, along with charging, would therefore appear inevitable. Parties agreed to communicate their responses via the Parish Council.